Over 4 carats of nature's most impressive stones in lustrous gold. The Natural Wonder Ring features almost 5 carats of lava and lightning's combined strength and beauty. 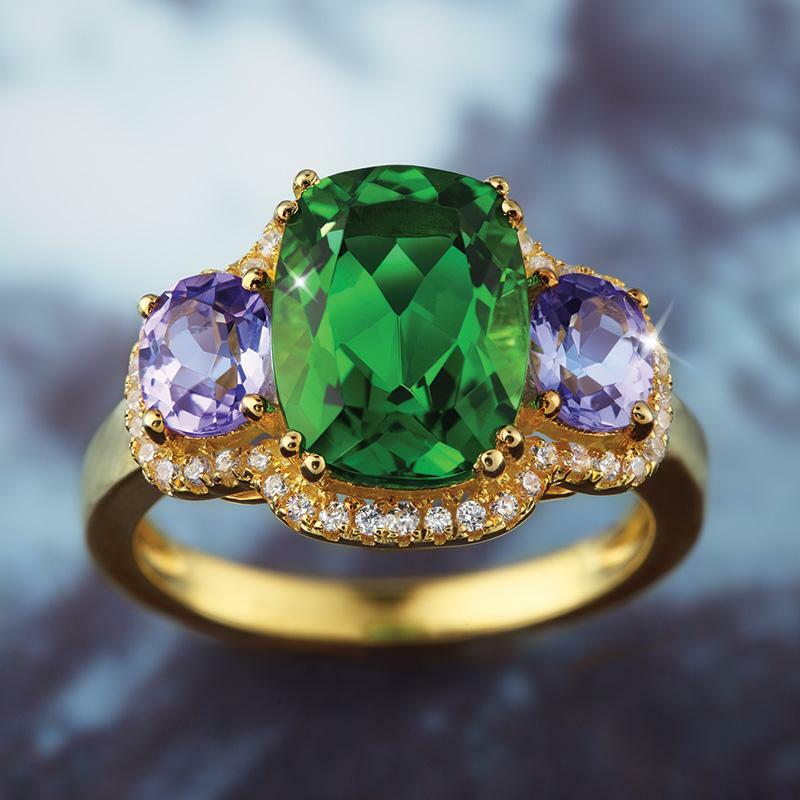 The gorgeous green of Helenite was formed when Mount St. Helens erupted in Washington, and the mineral contents of the resulting lava flow and volcanic ash were heated to form the often imitated but never bettered helenite stone. Tanzanite lay undiscovered in the foothills of Mount Kilimanjaro for millennia, until a powerful lightning bolt sparked a blaze that revealed the violet-blue wonder beneath. With its remarkable rarity and unique gemstone qualities, experts have dubbed it "the gemstone of the 20th century. Here a large cushion cut helenite stone and two oval tanzanite stones are beautifully framed by 44 lab-created DiamondAura® rounds and rest in a setting of luxurious genuine 10K gold. Both the gorgeous green of helenite and the violet-blue beauty of tanzanite were created by elemental forces that may never be replicated. But we were able to combine over 4 carats of these two natural wonders for a price that's a wonder in and of itself for a ring of such magnitude.